MS® Syringe filters are purpose-built with features designed to bring the highest levels of performance and purity to your research. 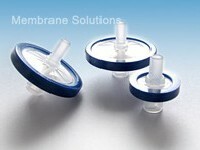 We incorporate a variety of membranes to offer separation and purification solutions for the majority of your laboratory needs. PP disposable filter devices are designed for use with aqueous or organic solutions containing high debris levels and for aggressive, hard-to-filter solutions.